If you follow an old diesel vehicle that's accelerating away, you know what’ll happen – a small black cloud of soot will puff out of the exhaust. That'll soon be a thing of the past though because, thanks to their new DPF technology, modern diesel vehicles are cleaner than ever before. The DPF is a filtration system, located within the exhaust system, which filters out harmful soot particles from the exhaust gases. The maintenance-free filter normally consists of a silicon carbide core, perforated by microscopic channels. The exhaust gas passes through the channel walls, on which the particulates collect. Does the DPF need changing regularly, like an air filter? No, the DPF is entirely self-cleaning, a process which is controlled by the engine management system and pressure and temperature sensors which detect when the filter must be cleaned. The exhaust temperature is then increased by deliberate multiple fuel injections into the engine, raising the temperature of the DPF to 600°C, which burns the soot particles without leaving any residue. The regeneration process takes place periodically, under normal driving conditions, without the driver noticing that it’s in progress. Vehicles that spend much of their time on short trips or in urban environments may require a longer journey at higher speeds to complete the regeneration cycle – in these instances a dashboard reminder light will inform the driver when this is required. If the driver ignores the warning light and waits too long to operate the vehicle at a higher speed over a longer distance, the DPF may not regenerate properly. If this continues it can damage the DPF completely, meaning it will need to be replaced at an authorised garage. If you think the Diesel Particulate Filter in your FIAT is damaged and needs replacing visit or call your nearest Pentagon FIAT Service Centre for advice. How does the DPF in my FIAT work? 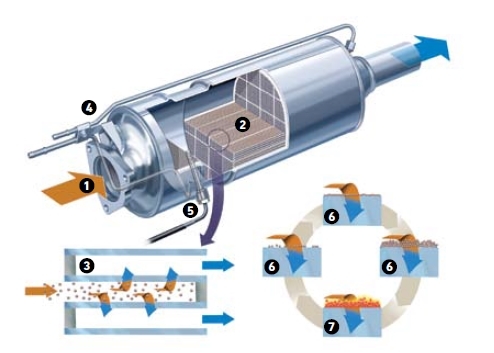 Upon entering the DPF (1) the exhaust gases are directed through the silicon carbide core (2) before being allowed to continue through the exhaust system. The construction of the core (3) offers a large surface area to the passing exhaust gases, giving a plentiful storage volume for collected soot. The soot volumes are monitored at all times by pressure and temperature sensors (4/5), which feed information to the engine management system to determine when the filter requires regeneration. When the soot levels (6) have reached their allowed limit, the regeneration process is initiated (7), in which the exhaust gas temperature is raised to 600°C, by multiple fuel injections, in order to burn off the soot particles.